The key concept of rugby is for the kids to have fun and be safe. Keep this in mind with all decisions. There will be NO grading in Under 6s to Under 9s for the Eastwood Village Competition, it’s all about participation. If there are enough players for two teams, then the teams will be picked on the basis of making the teams of an equal standard. Central Eastwood will look to field teams within competitive gala days for the Under 8s and 9s, for these events it will be at the discretion of the coach and manager to decide if teams are graded. If there are enough players for more than one team, then teams will be graded based on ability. A selection team of at least three people (including the coach) will be appointed to grade the players. If there is any disagreement on selections, then the CE Rugby Manager will have the final decision. 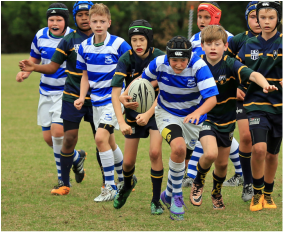 Coaches main aim is to teach the fundamentals of; team work, making friends and then improving the skill levels of all players so they can play rugby at the best of their ability.